Mr. Kimmel made this statement to local media concerning the cancelling of school on Friday, September 7th, due to an alleged threat. First I’d like to thank the parents and students who alerted us of this alleged threat. The school district has been working diligently with our School Resource Officer and law enforcement officials to resolve this situation. After an extensive and thorough investigation, Windber Police has deemed this alleged threat not credible. Although that news is welcoming, we will have a stronger police presence at tonight’s varsity football game and in our schools starting on Monday and will remain in effect indefinitely. School will resume on Monday, September 10th as usual. We realize that the school closing has created uncertainty and anxiety amongst most of you. As a result of resources that the school board allowed us to have in place, we have additional counseling services available. We encourage parents to talk to their children and use the resources on our website in helping them to understand, educate and cope with this most recent event. We are also assured by the daily presence of our School Resource Officer, Vince Mock, as he has extensive background experience as a retired state police officer. 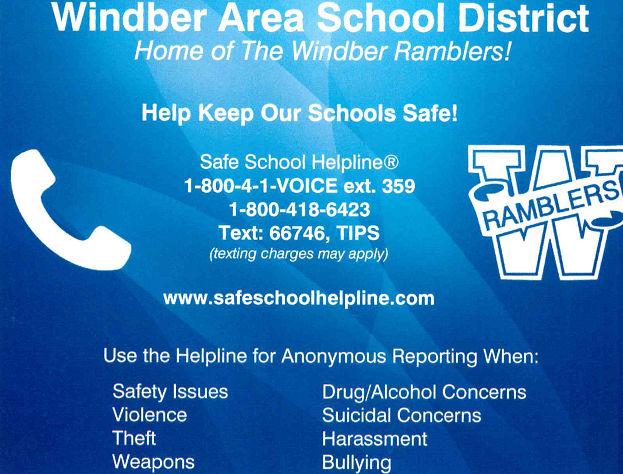 I am as proud to be part of the Windber Rambler community as I’ve ever been. Your cooperation and continued support in helping us to keep our students and school safe is greatly appreciated.